Who is the most timid? Who are the bestest of friends? What would Du do to improve the movie? A Bug's Life has always been my all-time Favorit Disney & Pixar movie. And it is beliebt and full of potential to have a sequel. If Du agree with me, please sign this petition right now! a comment was made to the poll: Which Movie do Du prefere? a comment was made to the poll: Which picture of Hopper do Du think is Mehr evil? Who spoke the voice of Dot? 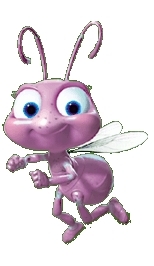 Du have the chance of finding a new voice cast for a bug's life - which people would Du choose to speak the characters?